This page contains information about the world’s most used tribometers, or slip test meters. The information on this page is available on a convenient, printable, one-page pdf file called Tribometers Compared if you’d like to print it out. Approximate price, USD: Low cost but not recommended for pedestrian safety testing. Device not offered by SDA, although we do perform tests if requested. Validation for pedestrian traction: None. Can give highly deceptive results if applied to slip potential of pedestrian; J. Forensic Sci. March 2007, p. 400. Advantage: Good workout: uses 50-pound weight lifted 112 times per test. Drawback: As stated unanimously by ASTM Committee 21.06, not suitable for evaluating slip-fall potential. Use: Surface quality control checks by tile manufacturers, in plant or in field. Advantage: Printed and electronic records. Cost effective for QC and multiple points on a property. Very simple to operate. Drawback: Measures DCOF up to 1.00 only. Dry tests not possible with some rubber test foot materials. Use: Periodic monitoring and new flooring slip resistance quality control using dynamic coefficient of friction. Source of test: ASTM E-303 as modified in 2005 by United Kingdom Slip Group. Endorsed by Ceramic Tile Institute of America (CTIOA). Validation for pedestrian traction: Greater London Council Bulletins 43 (1971) and 145 (1985), in continuous use since 1971 and adopted by 49 nations on four continents. Use: Surrogate where pendulum is not economical. Rapid monitoring by minimally trained staff. Visual demo. Source of test: Proprietary product — no ASTM standard required. Endorsed by Ceramic Tile Institute of America (CTIOA). Validation for pedestrian traction: University of Southern California Medical Center Study (Tortus II) published in J. Forensic Sci. March 2007, p. 400. Drawback: May not assess hydroplaning potential for running person. 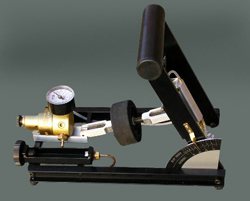 Use: Periodic monitoring, dry and wet, using hard and soft rubber test feet. The ASTM standard F1679-04e1, the only official test method using the Variable Incidence Tribometer (VIT, or English XL) was withdrawn by ASTM with no replacement in 2006 shortly after it was passed due to its inability to provide a reasonable precision statement; see www.ASTM.org/Standards/F1679.htm. This instrument is highly popular amongst professional expert witnesses because the result of the test can be easily and heavily influenced by the user to get the desired result. This makes it an excellent tool for an unscrupulous expert witness who needs to get the result desired by the attorney who hired him/her to run the test. The information on this page is available on a convenient, printable, one-page pdf file called Tribometers Compared if you’d like to print it out.